NAHA, OKINAWA PREF. - As many as 500,000 shoppers visited Aeon Mall Okinawa Rycom during the first week of its opening in Kitanakagusuku, central Okinawa, on April 25, turning it into one of the most popular places for shoppers in the prefecture. But the complex is not just another shopping mall. Aeon Rycom has been built on the site of a former golf course used by the U.S. military, which occupied the land during World War II. The site was returned to the prefecture in 2010. The apparent success of the mall is widely considered another strong piece of evidence to support an emerging conviction now widely shared by many Okinawans: U.S. military bases have become an impediment, rather than a benefit, to the growth of the prefecture’s long-troubled economy. “A big paradigm change is now taking place in Okinawa,” said Moritake Tomikawa, professor of economics at Okinawa International University and a key adviser to many local political leaders. Okinawa, which was occupied by the U.S. military until 1972, has long been in an economic slump. U.S. bases still occupy as much as 18.3 percent of the prefecture’s main island, leading to a sense of heavy frustration among locals, who harbor strong anti-military sentiment because of their memories of fierce ground battles during World War II. Still, local political and business leaders, as well as landowners, have long believed U.S. bases are essential to support the prefectural economy, where per capita income has been always ranked the lowest among Japan’s 47 prefectures and the jobless rate has been the nation’s highest for years. But mindsets are now changing. After seeing a number of successful redevelopment projects on former U.S. base sites, more of Okinawa’s political and business leaders are increasingly confident about the island’s economy, local experts say. In 2010, an expert panel assembled by then-Gov. 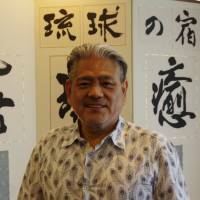 Hirokazu Nakaima submitted a report on Okinawa’s economic prospects up to 2030. The panel, chaired by Tomikawa, found the productivity of an average land lot in Okinawa was ¥1.6 billion per square kilometer, while that of 1 sq. km of land on a base came to only ¥900 million. “Bases . . . are curbing the economic productivity of the prefecture and distorting use of land,” the report concluded. 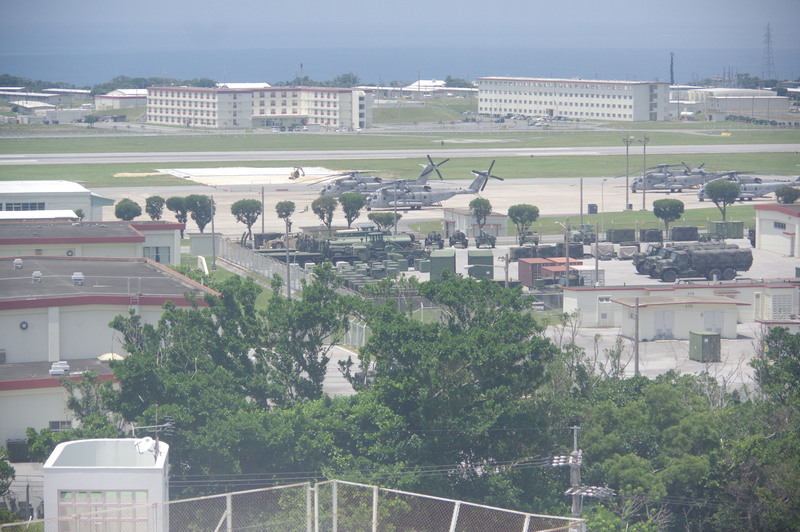 Many Okinawan landowners hoped the U.S. military would keep on renting their land indefinitely, thereby providing a stable income, because many past redevelopment projects carried out on returned base sites ended in failure. It often took years for landowners to form a consensus on how the returned land should be used, making large-scale redevelopment impossible. 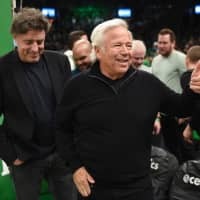 But in the case of Aeon Rycom, the leaders of a landowners’ 380-member union, quickly formed a consensus among themselves and succeeded in luring the shopping mall operator, based on lessons from setbacks experienced by many other communities. “For the past 20 years, I’ve continued to say (U.S.) bases are not economically beneficial. But for many, it didn’t ring a bell and they believed Okinawa won’t get by without military bases,” said Hiromori Maedomari, professor of economics at Okinawa International University. But Okinawa has now accumulated the know-how to redevelop former U.S. base sites and to date has seen a number of projects end in success, Maedomari said. 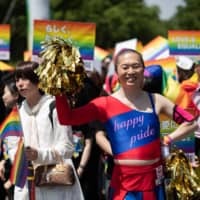 This is changing the mindset of many local leaders, even conservative business leaders, said Maedomari, who also served as chief editorial writer at the Ryukyu Shimpo, one of the two major local newspapers. This move was also reflected in last November’s gubernatorial race in which former Naha Mayor Takeshi Onaga was elected, beating the pro-base incumbent Nakaima. 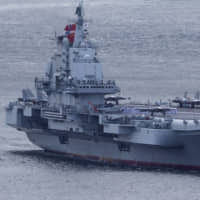 A few months earlier, Nakaima had approved the relocation of U.S. Marine Corps Air Station Futenma from the city of Ginowan, central Okinawa, to Nago, further north on the island, consenting to the construction of the alternative site in exchange for a central government promise of huge development funds for the prefecture. This caused uproar among locals, who believe Futenma should be relocated outside of the prefecture altogether. Nakaima had been supported by six major companies based in Okinawa that played key roles in assisting him and his predecessor, Keiichi Inamine, win the governor’s post. But in the November election, two of the six corporate groups, the Kariyushi hotel group and the Kanehide construction group, left the six-company group and threw their support behind Onaga instead, who opposes the Futenma relocation plan.Most other influential, pro-base business groups in Okinawa supported Nakaima. But in the end, Onaga won by a large margin, as he was able to draw on the support of voters opposed to the Futenma relocation. The facility, along with U.S. Kadena Air Base in central Okinawa, is considered one of the most important American military bases in the prefecture. If the anti-military movement gains further momentum in Okinawa, it could shake the very foundation of the Japan-U.S. military alliance. “(Okinawan people) now keenly feel local economic changes are taking place. 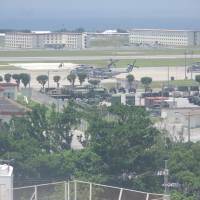 More now believe Okinawa does not need military bases any more,” said Chokei Taira, CEO and chairman of the Kariyushi hotel group, during a recent interview with The Japan Times. In the past, many business leaders in Okinawa thought U.S. bases were an indispensable part of the prefecture’s shaky economy. But far more of them now share Taira’s perspective in opposing the Futenma relocation plan than before. “If you look northward, you see a population of only about 120 million (throughout the rest of Japan.) But (if) you look southward, you see a population of 2 billion” in other parts of Asia, Taira said. As Taira pointed out, the booming economies of China and Southeast Asia have boosted the number of foreign tourists visiting Okinawa, which in turn has given the prefecture’s leaders more confidence to try to stand on their own two feet. In 2014, the number of tourists to the prefecture surged 10 percent to a record-high 7.05 million. Within this total, the number of foreign visitors jumped 62.2 percent to 893,500. On the business front, All Nippon Airways Co. launched a 24-hour cargo hub service at Naha airport in 2009 to take advantage of Okinawa’s geographical position, a move that proved to be a great success. When cargo flights depart Naha between 10 p.m. and midnight, they can arrive at most major Asian cities at around 6 a.m. to 8 a.m. the following day, giving the carrier a big advantage over competitors. Thus, since 2008, international cargo being handled at Naha airport, which was once used almost exclusively by domestic tourists, increased about 100-fold, reaching 185,087 tons in 2014. With this amount, it became the nation’s fourth-largest airport in terms of international cargo volume. “(Asian countries) were once places of manufacturing for Japan, but they have now turned into markets. (Okinawa) is in the best (geographical) position in Japan to approach them,” Taira said. 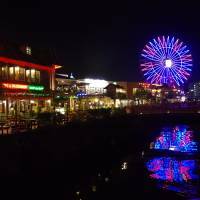 In a 2009 report published by the Japan Center for Economic Research, Okinawa, one of the few prefectures whose population is projected to keep expanding for the time being, was ranked top in an economic growth estimate covering the years 2007 to 2020. The center projected the prefecture would have an average annual growth rate of 1.07 percent. Tokyo placed second, followed by Kanagawa and Aichi prefectures. 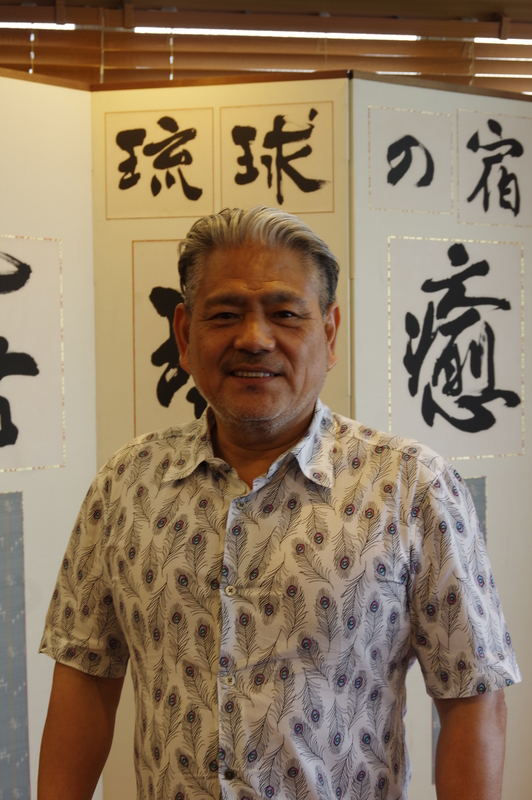 Tomikawa of Okinawa International University said it is only recently, probably a few years ago, that experts and media outlets started to be more optimistic about Okinawa’s economic future. But at the same time, he warned against being too bullish. 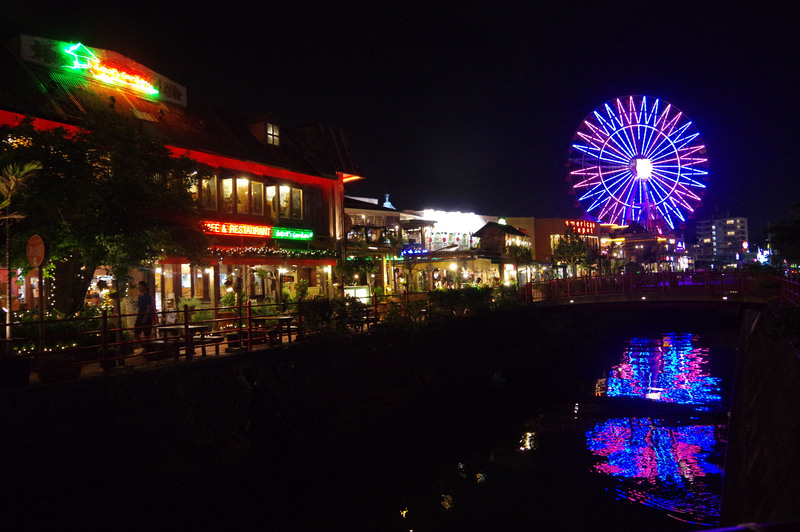 The redevelopment project of former U.S. base sites in Chatan, central Okinawa, has been often regarded as one of the Okinawan nonmilitary economy’s great success stories. The site, named American Village, is thriving with its many U.S.-style fashion boutiques and a resort-style hotel, and it has brought far more economic benefits to the local economy than when the site was used exclusively by the U.S. military. But total retail sales figures for Okinawa have not significantly grown since the American Village opened in 1998, Tomikawa pointed out. This means the Chatan area has built its prosperity on the ability to draw shoppers, diners and tourists at the expense of other establishments in other areas, in a zero-sum game playing out within the prefecture. Meanwhile, Okinawa’s population, although it still boasts a high birth rate compared to other prefectures, is forecast to begin shrinking in around 2021. Once the population starts to decline, its impact will be grave because many top companies are dependent on Okinawa’s domestic economy, including retailing, banking and electricity companies, Tomikawa said. “If the population decreases, the foundation of the Okinawa economy will be shaky. 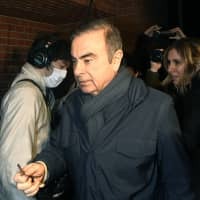 So we need to start building up more economic ties with the outside world now,” he said. The quickest and most effective way to keep boosting Okinawa’s economic potential is to further increase tourists from outside, Tomikawa said.